Tired of people disrupting you while you’re working in your cubicle? Looking to keep intruders out of your secret lair? Your problems are solved! Just set up a fully automated, 3D-printed sentry turret to shoot rubber bands at people trying to disrupt your day. The sentry, which was developed by engineering student Kevin Thomas in Switzerland, can be made with 3D-printed parts and an Arduino. 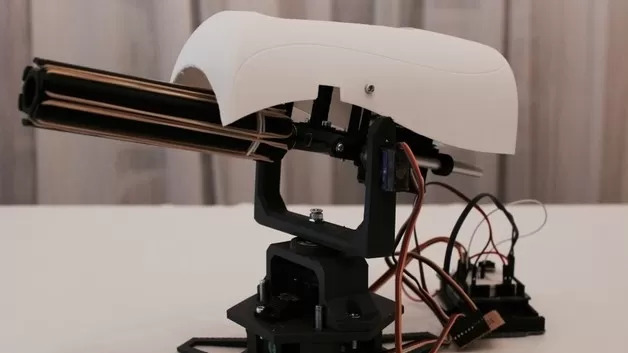 The sentry will scan for movement and rapidly shoot moving elements in its path, thanks to Thomas’s implementation of the open-source Project Sentry Gun software. The sentry can also be controlled manually via joystick, if you’d prefer to snipe your enemies. It can hold up to 6 rubber bands before it needs to be reloaded. Now if you’ll excuse me, I’m off to practice my Engineer song.